Hello and welcome to Day 3 of our February Rubber Die Release Showcase! 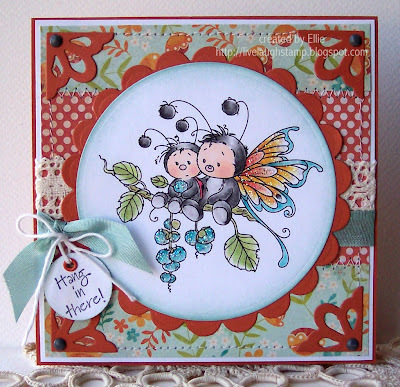 For today's card I used the super adorable stamp "Sympathy Bugs" from Whimsy's Sylvia Zet collection. Aren't these bugs sweet? I used my pencils and baby oil for coloring. Designer papers are from a 6x6 pack by My Minds Eye. The sentiment is a really old one by stampin up. I embellished with some lace, seam binding ribbon, and twine. The corners were cut out using Whimsy's brand new Corners Shapeology dies. To finish it off I did some machine sewing and added a little bit of glitter. OMG Ellie, I just love these little guys! Your colors are spectacular for the occasion too! This is a wonderful and bright card! I love the shimmer on the wings of the bugs. Those are the sweetest bugs ever. Just crazy about how you finished off the card.Off to continue the hop. Ellie. this is so pretty! Gorgeous coloring! I love how you colored the wings! Hello Ellie, what a beautyful card this time. I love the cute image and the papers you used are beautyful. I really like this image, and your colouring is awesome! The image really stands out against the background DP. Awww, these little fellas are SO cute!!! <3 Fab card! a brilliand and marvellous creation! the image is so sweet! This is gorgeous Ellie, I sure do love these little buggers and your colouring and design are fabulous!! Gorgeous coloring! I love the sparkly wings. Great card. Very cute. Love the details. Love this card. The image is adorable and love the colour combo. Adorable.. This is Definately my favourite image.. And Coloring with pencils and baby oil... Really!.. But it looks Great. Lovely shine and light.. I love the writing on the sentiment.. This card is so lovely. Love this cute image. Gorgeous coloring and I Love the details . gorgeous Ellie, such a sweet little image! Oh my goodness Ellie could this be any cuter! 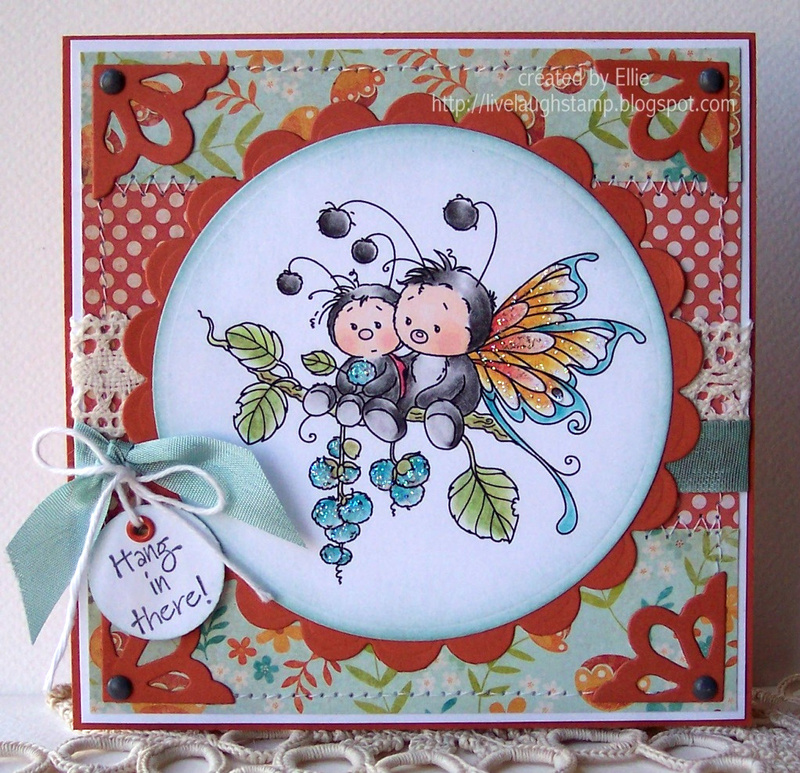 This little duo is darling...delightful card!! I'm curious about your pencils and baby oil coloring. If you get a moment could you drop me an email!! Absolutely precious! All the added sparkles really add a lot to the image. Gorgeous coloring job too! :-) Thanks so much for playing the Inky Impressions challenge! This stamp is just so cute thanks for sharing with us. Such a cute card, Ellie, love your image and that sweet paper! Thanks for joining us at the ColourQ this week. Beautiful colouring of this image hun..these little bugs look so adorable sat on that branch, gorgeous papers match perfectly..lovely corners..just ordered some of those, can't wait to get them lol!! This is too cute to look at! Wow you've colored this perfectly and the glitter.... LOVELY!! I am loving the diversity of all the new images. I have seen so many different ways to color and create and each are unique and special. Gorgeous card. Awww isn't this a cute duo? Love your color combo and gorgeous coloring. Great colors! I really love this stamp! What a pretty card. This image is so sweet. I think it's one of my favorites of the release. Kiitos kun osallistuit The paper shelter 52-haasteeseen tällä kauniilla kortillasi! Sooo cute! Love the sparkle on the grapes! Your card is so sweet & very cute. Thanks for joining us at Inky Impressions. This is such a cute image. So cute love evertyhing about it! Thank you for joining us at The Stamping Boutique. Such an adorable card, Ellie! That image is so cute! Thank you so much for joining us at the colourQ this week! aww, these little bugs are the cutest! and they're so beautifully coloured! Ellie this is just the most dear of cards. I adore that sweet image and your coloring with the pencils is lovely. Great touch with the added sparkles and your card layout is fabulous. I love this. Thanks for sharing it with us at Inky Impressions!